The following report was released by the U.N. Office of the High Commissioner for Human Rights (OHCHR) on March 19, 2015. 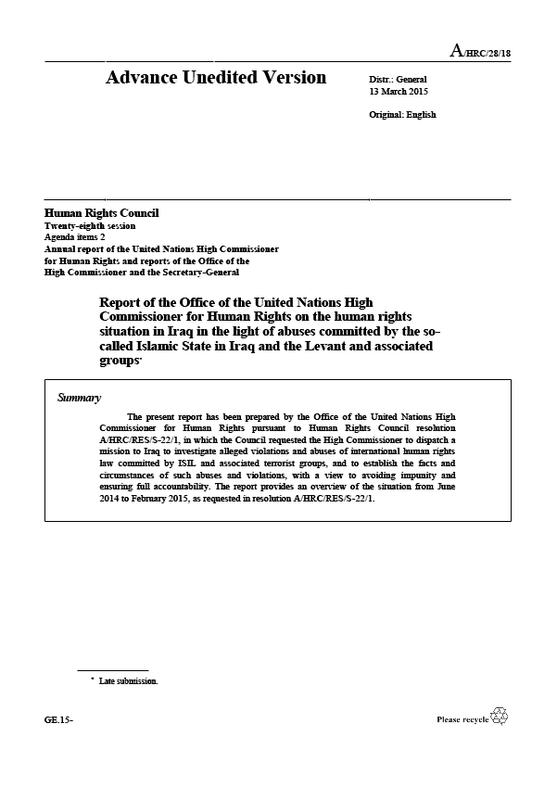 The present report has been prepared by the Office of the United Nations High Commissioner for Human Rights pursuant to Human Rights Council resolution A/HRC/RES/S-22/1, in which the Council requested the High Commissioner to dispatch a mission to Iraq to investigate alleged violations and abuses of international human rights law committed by ISIL and associated terrorist groups, and to establish the facts and circumstances of such abuses and violations, with a view to avoiding impunity and ensuring full accountability. The report provides an overview of the situation from June 2014 to February 2015, as requested in resolution A/HRC/RES/S-22/1. 16. The mission gathered reliable information about acts of violence perpetrated against civilians because of their affiliation or perceived affiliation to an ethnic or religious group. It is reasonable to conclude that some of these incidents, considering the overall information, may constitute genocide. Other incidents may amount to crimes against humanity and war crimes. Ethnic and religious groups targeted by ISIL include Yezidis, Christians, Turkmen, Sabea-Mandeans, Kaka’e, Kurds and Shi’a. 17. Based on interviews conducted with victims and witnesses, and corroborated by other sources, the mission collected information regarding the killing of members of the Yezidi community and acts that caused serious bodily or mental harm to members of this group. Information also pointed to the intent of ISIL to destroy the Yezidi as a group when perpetrating these acts and to the existence of a manifest pattern of attacks against this community whose identity is based on their religious beliefs. If confirmed, such conduct may amount to genocide. Numerous Yezidi witnesses provided credible and consistent accounts, involving separate incidents and attacks, detailing how they were forced to convert to Islam or face death. 18. At the beginning of August 2014, a series of systematic and widespread attacks took place against a backdrop of ISIL incursions into the Ninewa plains and Yezidi populated cities and villages. Interviews with numerous victims and witnesses from al-‘Adnaniya, al-Qahtaniya, Barah, Bazwaya, Dogore, Gogjali, Hardan, Khanasor, Kocho, Qani, Sharf ad-Din, Sinjar city, Solagh, Tel Banat, Tel Qasab and Zummar point to a pattern, whereby members of ISIL systematically separated the men from the women and young children; the men were subsequently taken away to nearby ditches and summarily executed. Some victims and witnesses added that they had been asked to convert to Islam and that the men who refused were killed, while in other instances even the men who converted were still summarily executed. Men who managed to survive such executions, largely through being shielded by the bodies of other victims, relayed their accounts to the investigation team. Women and children who were held captive near execution sites also witnessed some executions. In some instances, villages were entirely emptied of their Yezidi population. 19. For instance, on 3 August, in Qani village (Sinjar) at least 80 men were killed in a single incident. The mission interviewed survivors. One of them recounted how they were rounded up and taken to a nearby ditch where ISIL opened fire on them. He added that at least 50 members of his extended family were killed. In Kocho, at least 700 men were killed in August. A survivor of one of the several Kocho village (Sinjar) massacres recounted that around 11 August, Yezidi men who refused to covert were separated from the women and then taken to a farm. An ISIL fighter told them ‘you will see now what will happen to you, you pagans and peacock worshippers’. Although the villagers were initially given assurances that they would be freed once they handed over their possessions, ISIL divided the men in four groups of 15, and took them to a farm on the outskirts of Kocho village. The Yezidi men were ordered to lay down facing the ground; they were filmed by ISIL fighters before being shot several times. Survivors informed the mission that some residents from surrounding areas assisted ISIL in perpetrating such killings. Witnesses consistently reported that ISIL fighters acted upon direct orders they received via telephone. 20. ISIL fighters abducted Yezidis on a mass scale, and detained many for months. For instance, a group of 196 disabled Yezidis, including elderly, children and ill persons were held captive in Mosul and Tel Afar and only released in January 2015. Many victims were forced to convert to Islam during their captivity. Around 3,000 persons, mainly Yezidis, allegedly remain in ISIL captivity. Further investigation is needed to establish the precise number of those who continue to be held by ISIL as well as the numbers killed, estimated to be in the thousands. 21. Although perceived as the ‘People of the Book, a classification that grants them a certain protection in comparison with other ethnic and religious groups, Christians suffered forced displacement and deprivation of property. By 6 August, an estimated 200,000 Christians and members of other ethnic and religious groups had fled from al-Hamdaniya, Ba’shiqa, Bartella, Tel Keif, and other towns and villages in the Ninewa plains before they were taken over by ISIL. Among them were 50,000 persons previously displaced from Mosul, mostly Christians, who had fled in mid-June in fear of ISIL threats when they were given the choice to pay a tax, convert or leave. Houses and property of Christians in Mosul have been seized by ISIL. 22. On or around 6 August, ISIL stormed the city of al-Hamdaniya (also referred to as Qaraqosh). Many witnesses stated that ISIL fighters pillaged and destroyed buildings in the city including historic Christian cathedrals and churches. Approximately 150 families were unable to flee. Before expelling them, members of ISIL took possession of all their valuables and identity documents. Witnesses also reported that during the attack grenades, mortars and rockets landed in areas still occupied by civilians. 23. Interviews conducted with victims and witnesses, and corroborated by reliable sources, make it reasonable to conclude that attacks were perpetrated against Turkmen, Shabak and other Shi’a groups. 24. Victims and witnesses from Amerli (Salah ad-Din), Barawjali, Bashir, Jerdghali, Qaranaz in Diyala governorate, as well as Ba’shika, Bazwaya, Gogjali, Omar Kan in Ninewa governorate consistently reported the same pattern. ISIL surrounded the village, killed the inhabitants who could not escape, burned and destroyed houses and businesses, destroyed Shi’a places of worship, and pillaged private and public properties. 25. On 17 June 2014, for instance, ISIL attacked the predominantly Shi’a Turkmen villages of Barawjali, Jerdghali, Qaranaz, north of Amerli, allegedly burning and destroying houses and property, as well as at least two Shi’a religious places known as Husseiniyas. Several people were killed defending the village, and at least eight were summarily executed by bullet wounds to the head. Also on 17 June, the Shi’a Turkmen village of Bashir, Kirkuk, was attacked by ISIL. More than 60 people were killed, including women, children and elderly. 26. In late June and early July, in Ba’shika, Bazwaya, Gogjali and Omar Kan villages, Ninewa, ISIL members allegedly summarily executed a number of men and abducted numerous Shabak community members. At the end of February 2015, their whereabouts remained unknown. One woman reported that on 20 June, her son and brother-in-law disappeared after being stopped at an ISIL checkpoint. Three days later, they were found dead in a cemetery – her son beheaded and her brother-in-law shot several times. 27. ISIL also laid siege to Amerli, Salah ad-Din governorate, starting 11-12 June 2014. Twenty days into the siege, ISIL members cut off the water and electricity supplies to the town. At least 15,000 people allegedly suffered from lack of power, food, drinking water, medical services and medicine. Residents were forced to drink contaminated water, which caused many to fall ill, especially children and the elderly. A woman and her new-born baby died due to lack of medical services. The city was shelled daily day with mortar rounds. One child, four men and a woman allegedly died from the shelling. The siege was broken on 1 September 2014 by ISF and affiliated armed groups. 28. Based on interviews with survivors, the mission received reliable information that on 10 June, more than 600 inmates of Badoush prison, Ninewa governorate, were summarily executed by members of ISIL. Early in the morning, the prison, which housed over 3,000 inmates, was taken over by ISIL. Prisons guards had allegedly fled before the attack. The prisoners were separated into groups according to their ethnic or religious affiliation. Sunnis were freed, while others, mainly Shi’a, were loaded on trucks, driven to a nearby ravine and shot. Some survivors said they immediately rolled into the ravine and were saved by other bodies landing on top of them. ISIL fighters kept shooting into the ravine at any moving body, including men who were screaming in pain.